Free trumpet lessons at NCMA. 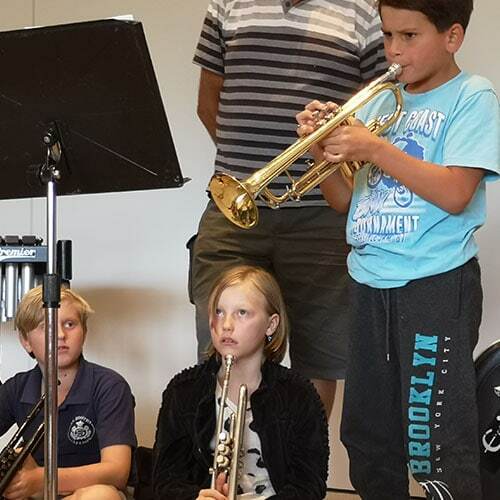 Trumpet playing uses a technique that is transferable to any other brass instrument and the ability to read and understand music is transferable to any other instrument, so students will be developing skills that can enable them to play in brass bands, orchestras, jazz bands, rock bands or as soloists. Lessons will be in a group of 3 or 4 students of the same ability level. Stage 1 beginners will learn to produce a sound and play a few notes that will see them playing simple tunes after just a few lessons. Students do need to organise their own instrument. If students don’t have their own instrument there are rental options available and rent-to-buy options. Please talk to us about instrument hire as an option. Please also note that all students need to be enrolled at NCMA to join our classes. There is an enrolment fee of $20.